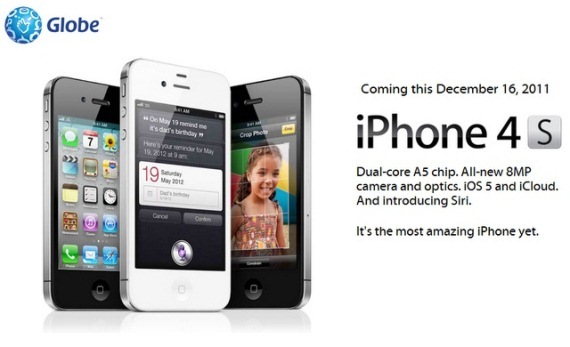 iPhone 4S is one of the most popular and must have smartphones today, specially this Christmas season. Globe Telecom has recently unveiled pricing for the iPhone 4S for prepaid and post paid plans in the Philippines. Globe has given its customers a wide variety of plans to choose from. In fact Globe’s iPhone 4S is even available in their Plan 299 via My Super Plan + SuperSurfPlan and the cash-out necessary for the iPhone 4S. If you have a BPI credit card, you can use it to purchase an iPhone 4S for 0% installment from 12 months up to 24 months. Globe will also be offering 20% discounts on its accessories for their subscribers until December 31, 2011. Globe’s pricing are a bit expensive as compared to Smart’s pricing. You may want to check it out also. New Promo for Nokia X2-01 Making It Free! iPhone 4 vs iPhone 4S: The major difference!